Hawk Performance Ceramic brake pads are designed for luxury vehicles and will improve braking power and feel over the stock ceramic pads. 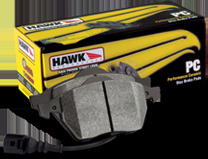 Hawk PC ceramic brake pads will not give you the extra noise and dust normally associated with performance brakes. The Hawk PC line increases stopping power and maintains the quiet braking luxury drivers are used to. Hawk Performance Ceramic brake pads are designed with real world drivers in mind, and so are focused on performance you want to live with rather than all out braking power. Hawk PC pads are designed to create as little dust as possible, so that your wheels don't require cleaning as often. Hawk ceramic brake pads also have a linear friction profile that results in less wear on both pads and rotors and can save you money over the life of your car. All Hawk PC brake pads are designed as direct OEM replacements, and will work with any brake pad wear sensors or ABS systems.